Brands are getting close to out-and-out owning music entertainers. What’s next? In a promotional age more complex than any time in history, brands continue to look for ways to capture consumers at the visceral level. This is a tall order in societies like ours that splinter out consumers into ever-narrowing segments conditioned to deflect promotional messages as a default behavior. In contrast, the music industry’s heritage is built on understanding and appealing to values, attitudes, interests and lifestyle. Music genres span every taste for every mood. So it’s no wonder that over the years, brands and bands have enjoyed a cozy fit: brands provide the money, bands provide the cache and association with lifestyles and values. Think Jimmy Buffett and you instantly taste the salted rim of a seaside margarita (Sandals Resorts?). Think Pink and you might get the urge to work out till you drop (Under Armour?). The balance between the non-conformist, no “sell-out” image of bands, and the opposite commercially-driven essence of brands has always been tricky business, but recently has become totally one-sided. As reported in a NY Times article, streaming music services have crushed the revenue structure of the music business, leaving bands with only touring and brand sponsorships to put fuel in the bus and pay for new guitar strings. Now deprived of revenues formerly generated by record sales, music entertainers are broke without sponsorships. Brands have poured buckets of money into live music sponsorships to the point they’re literally taking over the show. For example, an entire tour of Lady Gaga shows actually integrated Doritos product placement on stage and around the event. So where does all this lead? It seems as if brands are getting pretty close to out-and-out owning music entertainers. That scenario might not be too far off the trend. Since consumers drench themselves in music every day and position it as a mood identity device in their lives, what better way to entrench in consumer value systems than for brands to develop bands and solo artists of their own that write and perform songs projecting the values created by the brand. Not to suggest Mickey D’s Fat Pack or The Viagras as band names, but rather real bands with real names and real music and lyrics that never (or rarely) mention the brand name. The difference between this concept and blatantly sponsored bands of today is that the band/entertainer would be developed from the ground up by the brand that owns exclusive sponsorship rights. The music, lyrics, and image would project the brand’s values and image (Brad Paisley and Dove Men?). The original “values-aligned” music could be leveraged (instead of licensed) for brand advertising, events, videos, internal morale and alignment, and many more applications limited only by the boundaries of creativity. A hit song could mean a boon for the brand. And vice versa. If the music is good, does it make any difference how it’s funded? Would the market buy into this kind of low profile “brand-backed band?” What do you think? What do you think of when you hear the term cause-driven marketing? Is it about charity? Marketing? Brand? Or a company? The hazy cloud around this type of positioning makes me pause, considering that the basic function of marketing is pretty clear: activities involved in bringing products, service, or ideas to market. In essence, meeting demand with supply. So what does “cause driven” have to do with demand and supply? I’ve worked in the marketing and promotion business for more than 30 years, and though everything is different, nothing has changed. Since the days of Darrin Stephens and Don Draper (or Draper Daniels, as it were), the promotional “P” of the marketing mix has scorched a path of skepticism between consumers and cause. Even as sustainability and cause- or purpose-driven campaigns trend higher, there seem to be only a few organizations that use these labels as little more than an emotional corkscrew to open consumer pocketbooks. And the organizational commitments often seem to fade as fast as the campaigns themselves. In my experience, weak credibility is often the consequence of attempting to position marketing as philanthropy. All this said, the few organizations that base their corporate visions and values on a focused humanitarian purpose truly enrich society in ways that exponentially improve the quality of life for creatures of Planet Earth. In my opinion, the brands owned by these organizations earn their right to profitability every day in a way that deserves longevity. And today’s new millennial mind set contributes a very effective “BS filter” to help police exploitation of real causes. This blogpost presents some important distinctions between the different types of cause-driven efforts; distinctions that can make the difference between exploitation and salvation. These are marketing campaigns for goods and services in almost any category that donate a portion of their profits (in money or resources and/or supplies) to a cause, such as a charity. In contrast to campaigns, cause-based organizations directly tackle a social problem with a donor-funded business model. Saha Global (http://www. http://sahaglobal.org) for example, began by enabling Ghana’s women—traditionally the ones in the home who are in charge of water—to become entrepreneurs through a training and monitoring program. Saha Global programs like this one teach the Ghana women how to collect and purify water by hand, and then sell the potable product at an affordable price. It addresses the issue of scarcity of potable water for villages while providing income for the women entrepreneurs. Brands that are driven by cause focus on developing commercialized products, services, or programs to help solve issues that benefit society. Examples can be found in biological pest control (biocontrols) or crop protection product companies who research, develop, and manufacture natural solutions to keep insects and weeds from reducing food production of farmland or threatening public health. Considering that the earth will need to produce as much food in the first 50 years of this millennium as it did in the last 10,000 years, and the threats of vector disease such as the Zika virus, biocontrols are a big deal to everyone. Add to this many centuries of chemical pesticides stripping soil of nutrients and accumulating toxic residue that can end up in the food chain, and you’ve got a bona fide cause within a for-profit business model. Another example of a cause-driven brand is Toms Shoes (http://www.toms.com/improving-lives). Toms Shoes is a unique socially conscious shoe company with a mission to improve the conditions of children living in poverty. There are no complicated formulas, simply for every pair of shoes purchased, Tom’s donates a second pair to a child on in need. A conspicuous distinction of cause-driven brands is that they don’t focus on only cause-driven marketing, but operate on a commercial cause-driven business model. There’s a huge difference. A true cause-driven brand exists to serve its selected humanitarian issue by applying specific commercial solutions to targeted facets of that issue and thus leverage the economics of mass consumption to serve the cause. Unlike campaigns that come and go, donations that are ad hoc, or non-profits that directly address a humanitarian cause as their main course of activity, the cause-driven business model unites commercial and humanitarian motives. Rather than manufacture need, as in the case of the vast majority of brand marketing—or ask for handouts as in the case of cause-based organizations—cause-driven brands tackle existing humanitarian issues continuously as a part of their pursuit of profitability. The cause-driven brand perspective can help unite and galvanize the entire value chain. The participants in the value chain—consisting of manufacturers, distributors, processors, retailers, and consumers that bring value to one another—can all focus on a purpose of greater good as common ground. This facilitates commerce among them all while solving real world problems. Wouldn’t the world be a better place if every commercial brand operated this way? Let us know your thoughts. B2B brand equity, B2B branding, brand brand focus, Competitive strategy, marketing branding, marketing strategy, middle-market companies, operationalization, positioning, what is brand strategy? In 1980 Michael Porter transformed the marketing world with his text on Competitive Strategy. It remains a brilliant work in its simplicity, a fundamental approach to analyzing the competitive landscape. Porter’s five forces brought clarity to a topic muddied by countless unproven approaches. 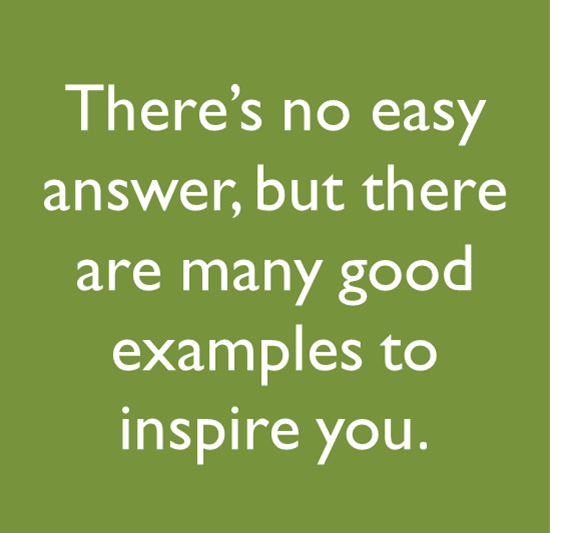 But there’s even a simpler approach: Three words that inspire even the smallest competitor to dream big. If you can’t compete with the big boys in their space, make a smaller space. Control the scope of your solution to one only your brand can satisfy. Of course it has to be realistic and meaningful to customers. But by the fundamental laws of mass merchandising, customization of solutions will almost always be rewarded with greater target attention and higher profit margins. Many marketers mistake market opportunity for market size. But consider this: Would you rather own a 1% share of a market that’s 1 million strong or a 30% share of a market that’s a tenth that size…with higher profit margins? I know. It’s against a marketer’s very nature to think small, but as a strategic consideration, it can be the best fuel your small or middle-market brand can get. And with all you’ll learn at a lower risk inherent in a more tightly defined market, you’ll be far more efficient at expanding to larger ponds later. This kind of long run approach drives long-term brand profitability. 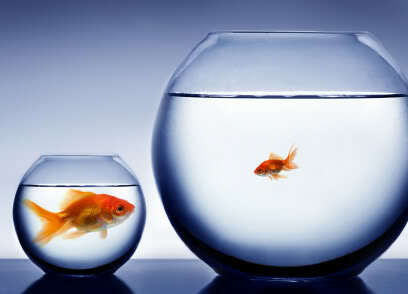 If you can’t be a big fish in a big pond, shrink the pond. You can’t put a whale into a fish bowl. But it doesn’t take a huge fish to rule there. So here are a few tips to shrink your way to success. First focus on your customers. Draw careful distinctions between what customers think they WANT and what your expertise tells you they truly NEED to satisfy that want. For example, people have long searched for their favorite radio station that plays the kind of music they are in the mood for, when they are in the mood. What they really needed was a way to access a personally customizable music playlist without buying all the recordings. Enter Pandora. People couldn’t “want” it because they didn’t know the technology existed. The magic lies in the way you analyze and interpret a customer stated want. Next focus on your offer. Second, focus your offer and positioning so tightly that the offer itself actually defines a segment, albeit smaller. Competitors tend to disappear when your brand appears to be the only one that can satisfy a very specific set of needs. This strategy done right can make your brand appear as prominent as the giants, to those who matter. Then focus on your motives. Be authentic. If your brand is truly customer focused in the most authentic way, you have no competition in the traditional sense. In its place, you have a commitment to serve your customers in a way they cannot be served elsewhere. That demands being constantly connected to your customers as well as non-customers. Anticipating their needs. Developing solutions based on your thought leadership around the application of new technologies, techniques, and trends. And don’t forget about alignment. Aligning your business goals with those of your customers and your employees makes for a self-perpetuating success. Be sure to conduct a strategic alignment exercise at least once a year to be sure your brand is keeping up with changes in technology, regulation, competition, and other market forces. For more on this topic, see Getting There From Here: Bridging Strategy and Execution, by Greg French. Even with adequate communication, strategic misalignment can occur. The best way to get every employee on the same page is with learning by doing. As hard as leaders try, it’s rare that downstream execution efforts precisely reflect initial scheduling and strategic intent. And it’s not just misalignment of the ranks that’s to blame. After all, most organizations spend a lot of time and money communicating strategic plans – even to the point of asking downstream stakeholders if they are clear on strategic priorities … “Yes” is an easy box to check. The above-mentioned HBR article, “Why Strategy Execution Unravels—and What to do About It” (March 2015) is based on a survey administered to 7,600 managers in 262 countries across 300 industries. It lists five of the most pervasive myths surrounding the gaps between strategy and execution, which account for unsatisfactory business results. The article is a great read and lands on a premise espoused in my book, “Getting There from Here: Bridging Strategy and Execution:” Though many organizations are expert at communicating strategic objectives to stakeholders, communication is not enough. Memorizin g a few bullet points won’t assure flawless execution. In fact, “flawless execution” itself promotes a perspective that undermines its own intent by implying lack of flexibility. It doesn’t account for changes in the environment and the myriad variables often visible only to the eyes and ears of those downstream. When a football receiver finds himself in possession of the ball and he’s suddenly staring down a wall of defense that looks decidedly different than in the planned play, he makes a decision to run out of bounds instead of toward the goal line. Though he did not execute “flawlessly” according to the plan, the result outweighed the risks, and still racked up yardage—the strategic priority. To stick with the original plan may have meant being tackled, injured, or risk a fumble and turnover. It was a judgement call by a receiver downfield who had perspective no other player or coach could have. In the same way, delegating downstream decision-making for strategic execution can distribute responsibilities among stakeholders. This unburdens leaders from the consequences of blind spots often encountered when “puppeteering” from above. Ideally strategic priorities are expressed in terms of how they benefit customers directly or how they benefit the organization so it can better serve its customers. Through this lens, execution may not look exactly like what the strategic architects envisioned, but it can be even more effective. More than just communicating, truly educating and training all levels of stakeholders about their active roles in supporting strategic priorities is essential to bridge strategy and execution. Allowing for flexibility in strategy can take advantage of downstream perspective as well as help master the art of agility. Donald Sull (senior lecturer at MIT Sloan) coined the “strategy loop” concept, which allows for reshaping strategy, potentially in mid-play, to account for changes in any number of variables. Given our modern era ability to garner real-time feedback, it’s more important than ever before to ride the reshaping waves of change toward executional success. To do is to learn. People can learn how to directly contribute to strategic priorities faster if they are shown direct links between their daily jobs and the priorities. This can be accomplished by providing downstream stakeholders with concrete, measurable examples of things they can do every day in the course of their functional roles to address specific strategic priorities. Ideally, these tasks should be framed in a customer focus. With this in place, organizations can harness untapped power for execution. This strategy can empower every soul in the organization to put their shoulder to the same wheel—all in the name of the customer. As personal relevance to strategic priorities increases with stakeholders, so does distributed power for execution. Though the idea seems “V8-simple,” in practice it can be a significant undertaking. This kind of change proposition requires a deliberate commitment of resources and a permanent shift in culture. The best way to begin is to focus on confirming your downstream stakeholders (those in your critical path for execution) truly understand the strategic intent, how they can actively participate in achieving it, and what it means to them in their role. What are the ingredients of powerful RAPPORT? How can you harness the force that projects charisma, persuasion, negotiating power, and credibility to all the stakeholders who affect your work life? Not only your boss. Not just your team. But people within every function of your organization and all your brands’ stakeholders, including customers. To take it even further, RAPPORT can be scaled to unite brands and their customers, employees and employers; all to achieve real business results. Believe it or not, this kind of power can be acquired by following only seven down-to-earth steps called The RAPPORT Process™. (A) Analysis — Determine not just what they want, but what they need to do to get what they want (your strategy). Pick your battles by focusing on needs that your solutions can best facilitate, and the segments that value them most. (P) Positioning — Develop a way to deliver your strategy that addresses your stakeholders’ perceived wants. Begin with their objective and work backwards to your own. Focus on the single facet of your stakeholders’ want that you can “own.” Let them discover all the other great benefits later. Be big somewhere, rather than small everywhere. (P) Planning — Once you know what your stakeholders want and what they need to do to get it, you need a detailed approach. Formalize the events, costs, benefits, and sequence in a plan. (T) Translation — How can you do this better next time? Imagine everyone in your organization—from the stockroom to the boardroom—using this process to deal with every kind of issue from improving shipping efficiencies to launching new brands. Minds aligned. Conflicts averted. Cultures united. Commerce accelerated. Efficiencies unlocked. Common process means common language and focus. And that means a better rapport, which opens a whole new universe of benefits—all from operational alignment through The RAPPORT Process. Much like the Quality movement in decades past, the RAPPORT revolution can help businesses achieve greater customer satisfaction, increase revenues and margins, and improve operational efficiencies. GroPartners is launching a multi-year trial of our trademarked RAPPORT Process for organizations that believe alignment sets into motion a chain of heightened customer and employee satisfaction, which leads to enhanced revenues and margins. Our aim is to build a case of solid metrics on actual organizational implementation. Contact us if you’d like to participate in our trial. This process might be a way for you (and your fellow employees and your customers) to get everything you want at work this year, and beyond. You can read more about the RAPPORT Process in my new book, “Getting There From Here: Bridging Strategy and Execution” available on Amazon http://amzn.to/1yK9DTG or digital version on Apple iBooks. B2B brand equity, B2B branding, brand, brand marketing, brand metrics, brand positioning, brand promise, brand ROI, brand scope, brand strategy map, branding, Bridging Strategy and Execution, Employee engagement, Getting There from Here, internal branding, marketing branding, marketing strategy, operationalization, positioning, virgin companies, vision, what is brand strategy? Many organizations are very good at developing brand and marketing strategies that have the potential to produce excellent business results. But often these strategies become diluted or even derailed due to misaligned execution. Other organizations are experts at flawless execution of strategies that may not align with actual customer behaviors and organizational goals. The reality is that it takes both to succeed. And that requires a holistic approach, connecting internal and external components to create a symbiotic brand. When marketers fail, it is generally tied to their inability to connect strategy with in-market execution. My new book, “Getting There from Here: Bridging Strategy and Execution,” takes on the task of not only outlining how critical it is to bridge this gap but also identifying the rewards on the other side: operational excellence and in-market impact. It is an excellent reference for perspective and processes that help bridge expectations, experiences, and behaviors among all brand stakeholders at every touchpoint. Visit http://amzn.to/1yK9DTG to download a copy. Whatever your goals, it will help you get there from here by giving you tools and processes to effectively bridge strategy and execution for better business results. I’d love to hear from you how this book helped improve your business results. Post your comments here or email me gregf@gropartnersconsulting.com.